When I received the Lord Jesus as my Savior, I was born into God's family. This is wonderful, but there is something God wants me to do. What is it? God wants me to become more like Jesus. 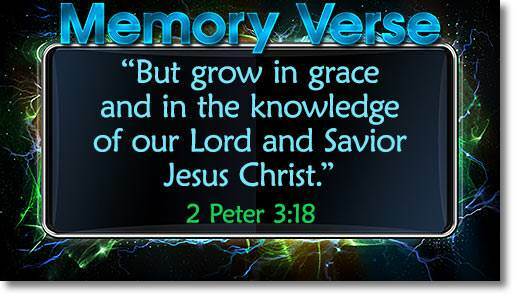 The Bible says, "…grow in grace, and in the knowledge of our Lord and Savior Jesus Christ…" (2 Peter 3:18). Every person who is born again comes into God's family as a "newborn baby" spiritually. We all like to see a tiny new baby. But it is a great tragedy if, five or ten years later, the baby has not grown. God loves His newborn children, and He wants us to grow spiritually. God is saying to us, "I want you to become more like My Son every day!" In this lesson we are going to think about four things that will help us to become more like Jesus. 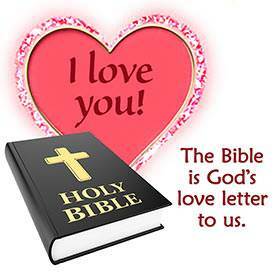 The Bible is God's love letter to us. The most precious story in all the Bible is the story of how the Lord Jesus loved us and came into the world to die for our sins so that we might belong to Him forever. As we read the Bible, we must depend on the Holy Spirit to teach us. The Holy Spirit lives in every child of God, so He is always with us. Every time we open God's Word, let us pause a moment and ask the Holy Spirit to teach us its truths. 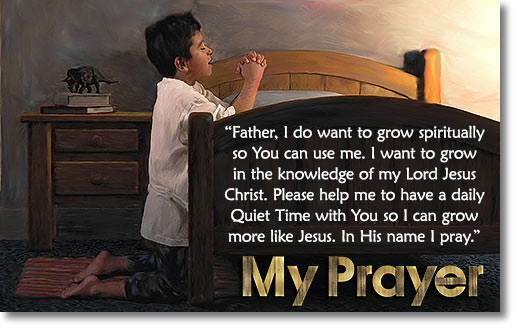 We can pray, "Dear Holy Spirit, please teach me what You want me to learn from God's Word." Begin reading God's Word today! The Gospel of John is a good place to start. Read a chapter or part of a chapter each day. Do not skip around. When you finish the Gospel of John, you can start with the Gospel of Matthew and read through the whole New Testament. God has a special blessing for those who memorize verses from His Word. The Bible says, "Your word have I hid in my heart, that I might not sin against You" (Psalm 119:11). To "hide God's Word in your heart" means to memorize Bible verses. This will help you grow more like the Lord Jesus. It will also help keep you from sinning. When Jesus was here on the earth, Satan tempted Him. Jesus knew God's Word, so He answered Satan's temptations with words from the Bible. Satan had to leave Jesus alone because he was defeated by the Lord Jesus, using God's Word. The secret of memorizing is to say the verse again and again over a period of time. One of the best ways to memorize verses is to write the verses on cards. On one side of the card, write out the verse. On the other side write the reference—the place where the verse is found in the Bible. When you learn a verse, always learn the reference! Be sure to copy the verses and references correctly. Carry the cards with you and go through them as often as you can during the day. Look at the reference on a card and see if you can say the verse. Check yourself by turning the card over and reading the verse correctly. If you do this many times a day, you will soon have those verses memorized. Then you can add new verses. Every time you memorize verses from God's Word, you are equipping yourself with another tool to use in serving God. It is also a powerful weapon to defeat Satan. Now comes the hardest thing of all. We must not only read God's Word and memorize it, but we must obey it. Suppose your father was honored by his company for being the most faithful worker on their staff. You thought that was great and you decided you were going to be faithful just like your father. Then your father was called away on business for a week and he wrote out a list of the things he wanted you to do for him while he was away. 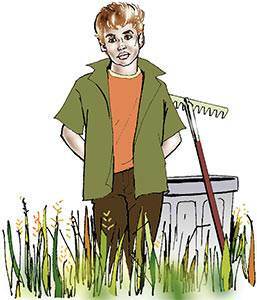 Every morning you took out the list and read it over: "Take out the garbage, cut the grass, clean up the backyard." Soon you had the list memorized, but you didn't do one thing on the list. When your father returned, do you think he would be pleased? No, he would not. Why? Because you had not obeyed him. Just reading and memorizing verses from the Bible will not cause you to become more like the Lord Jesus. You must do the things that the Lord tells you to do in His Word. Jesus said, "If you love Me, keep My commandments" (John 14:15). The secret of a strong Christian life is a daily Quiet Time with the Lord. What is a "Quiet Time"? It is time spent alone with the Lord, reading His Word and talking to Him in prayer. To form the habit of having a daily Quiet Time with the Lord, you need a definite place and a definite time. Find a place where you can be alone with the Lord. Decide on a definite time. For most people the best time is the first thing in the morning. Once you decide on a time and a place, stick to them! Remember, you are meeting with the Lord Jesus Himself—the King of kings and the Lord of lords! The Lord Jesus is our great Example. When He was here on earth, He rose early in the morning to have a Quiet Time with His Father. Do you want God to use you? Do you want to be a strong Christian? Do you want to win others to Christ? Begin now to have a daily Quiet Time with God. Most important of all, trust and obey the Lord Jesus. Say, "Lord Jesus, in myself I am weak and sinful, but You live in me. I am trusting You to live Your life in me today." When I was born into God's family, I was a spiritual baby. God wants me to grow! My spiritual food is God's Word. As I read the Bible and memorize verses, I grow spiritually. The secret of a strong Christian life is a daily Quiet Time with the Lord, reading His Word and talking to Him in prayer. Mr. Douglas tells the campers about Mr. Patrick. 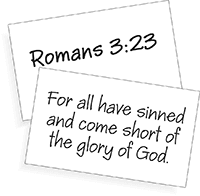 He also explains that any sin is wrong. Steven showed Maria and Susan the ruined wallet that he was making for his dad. They were looking closely at the ruined wallet. Steven said slowly, "I think Pete did it because I can tell he is still mad at me. I know I am supposed to love my buddy, but I am angry at him. How can I love a buddy who would do something like that?" "You can do it with the help of Jesus," Maria said with a comforting voice. Then Susan added, "Steven, when Maria forgave me for messing up her school-work, she helped me understand how Jesus can help a person to forgive. That is when I asked Jesus to come into my heart. The most important thing you can do for Pete right now is to love him." Steven did not want to hear that he should forgive and love his buddy, but he knew it was what the Lord Jesus would want him to do. Slowly Steven said to Susan, "I know you are right, but it is so hard to do. Mr. Ken said he would help me fix the wallet during our free time. I guess I better meet him to see what we can do." Then Steven turned around and headed back to the craft cabin. That night it was hard for Maria to go to sleep. She was thinking of how Steven was trying to forgive Pete. She was also thinking about the prize Bible. One of the counselors had said that Maria and Susan were among the five girls with the highest marks so far. She kept thinking how much Susan wanted to win that Bible because she needed a new one. But Maria also wanted to win that Bible. She finally rolled over and fell asleep. The next morning, Maria and Susan had just sat down for breakfast when Nancy came running over. She looked so cute in the jeans and the top that Miss Amy found for her. "Oh, I have the most exciting news to tell you!" Nancy said breathless. "Last night, Miss Amy talked to me and I asked Jesus to be my Savior! I have never been happier in my life." Her blue eyes were shining and her whole face was smiling. "That is exciting news!" exclaimed Maria. "Susan and I have been praying for you. Now your name is written in Jesus' special Book. It is called 'The Lamb's Book of Life.'" Nancy had a puzzled look on her face. 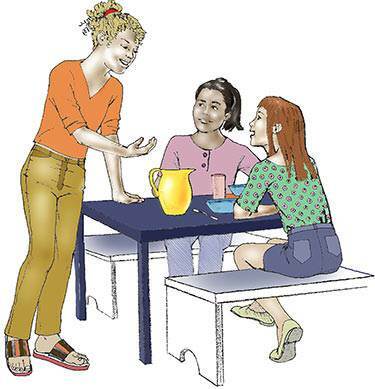 As the girls ate breakfast, Maria began to tell her about the Lamb's Book of Life. Whenever a person accepts the Lord Jesus as his or her Savior, the Bible tells us that the name of that person is written in the Lamb's Book of Life in Heaven. "This gets more exciting all the time," Nancy said. "I love camp, and I have made so many friends. I have so much to tell my parents when I get home." After breakfast, Maria found Steven at the lake. "Were you able to fix your wallet?" she asked. Steven smiled as he showed Maria the wallet. He told her how Mr. Ken had patched the cuts in the wallet. "I will not win any prize because Mr. Ken helped me, but it looks better than I ever thought it would. I hope Dad likes it." "I know he will. The cuts are hardly visible anymore," Maria answered. "By the way, do you still think that Pete took Bobby's money?" "I don't know," said Steven. "But whoever took that money must have felt sorry, because Bobby told me that he found a dollar yesterday in his suitcase on top of his clothes." After a moment Steven continued, "I don't feel mad at Pete anymore, but I cannot love him, at least not very much. But I am asking Jesus to help me. It sure is not easy to grow to be more like Jesus." "I know what you mean," answered Maria as she looked over the lake. The waves looked like foam or soap bubbles. Suddenly she remembered, "Oh, it was my turn to do the dishes, and I forgot all about it! Now I will lose points!" She turned around and ran towards the kitchen. At the kitchen door, she met Susan coming out. "I forgot to help with the dishes. Did they call my name?" Maria gasped. Susan put her arm around Maria and led her away from the kitchen. "Yes, they called your name, Maria. But when I saw you were not there, I said that I would change with you. I have just finished. "You can take my place tomorrow. It is okay, kids do it all the time, and the ladies in the kitchen don't mind who is helping." Maria took a deep breath and said, "Susan, thanks so much. I would have lost points if you had not taken my place. You are a wonderful friend." Just then the bell rang for the morning session. The girls got their Bibles and followed the crowd into the building. "I hope Mr. Douglas does not call my name to say the golden verse today," Susan whispered nervously to Maria. "I did not have time this morning to go over the verse." "I know why you did not have time. I am sorry, Susan. It is all my fault because I forgot my kitchen assignment, and you filled in for me," said Maria. Shortly after they sat down, the session began. Susan was nervous during the songs. 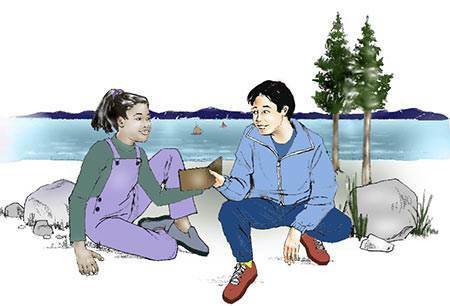 Then Mr. Douglas began to call on different campers to say the verse—and Susan's name was the second one. Susan stood up and started out very well. But suddenly, Susan stopped. Maria, sitting besides her, wanted to prompt her, but that was against the rules. 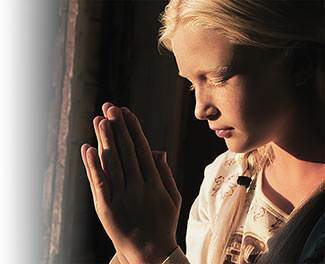 Instead, Maria prayed silently, "Dear Jesus, please help Susan remember the rest of the verse." Did Pete take Bobby's money? Was Susan able to finish saying the camp verse? Find out in the next exciting chapter.